The Life of Mo: On trying to LET. IT. GO. On trying to LET. IT. GO. Wednesday was not my favorite day at work. I had child sexual abuse training in the morning (so important, but so emotionally devastating), a meeting during lunch, and then CPR training in the afternoon, where I tried not to think too much about emergencies and people dying. Plus, while most of the people at the school have been wonderful and welcoming, I have discovered a couple co-workers who have already made it a habit to "give me advice" couched as "looking out for me", but who are really just telling me what to do in a way that insults my intelligence. So, I had to spend some time decompressing and praying and thinking about boundaries. And letting it go. 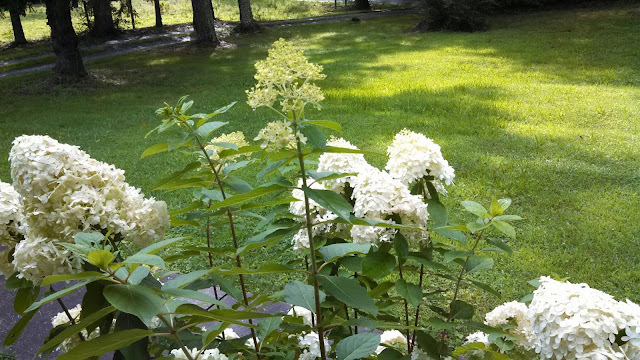 I sat with Piper on the porch and looked at our beautiful huge hydrangea bushes. I coming to terms with the fact that we work at a boarding school and this is registration weekend, so I'll be at work for much of Saturday and then Sunday afternoon. And I'm teaching 1st and 2nd graders at church on Sunday. Piper's birthday is Tuesday, and I don't think I'll have time to make her a cake. And then there's the girls' birthday party we're hosting on the next Saturday (I do have to make the cupcakes for that), and my in-laws are coming to visit, and I think I'm supposed to speak to the entire student body on Monday about volunteering in the library...and...and...ack. Praying for you dear daughter! Let me know what I can do to help. Do I need to come earlier this Sunday? I could probably leave after Sumday School which would get me there about two instead of 4:30 or 5. Please don't let us coming stress you sweetheart. You know I enjoy helping out, so just let me know what I can do to help. Maybe you can have some down time while we are there to help with things. We love you and you are in our prayers.